David: Sometimes to create, one must first destroy. The ship which Ridley Scott’s latest foray into outer space is named for, PROMETHEUS, is itself named after a Greek god. In case you’re unfamiliar, this particular God is not only credited with the creation of man, from clay no less, but also with providing mankind with fire and the possibility of progress. The trouble is he had to steal the fire in the first place and so his deed would need to be punished. Aside from eternal torment and torture, Prometheus would also be forever known as a symbol for overreaching and the often unfortunate consequences of doing so. There is only one person doing any overreaching on this ship though and that’s the director. Not to mention, it would seem to me that naming an exploratory space ship thus would just be more of a subconscious effort to sabotage your chances for success than anything else. PROMETHEUS opens with stunning shots of landscapes and waterfalls and culminates in a bizarre spectacle that announces the possibility of a truly unique and breathtaking film experience. It then moves rather quickly into all too familiar territory. Type on the screen dictates the time and place of the mission, while people are asleep in pods on the ship, and an android watches carefully over them with some potentially questionable motivation. There were months of speculation but now there is no denying that this is an alien movie, somehow connected to Scott’s seminal 1979 film, ALIEN. It isn’t made clear just how at first but it certainly follows exactly the same pattern as his original film, as well as James Cameron’s sequel, ALIENS. After everyone wakes up, they pal around in the cafeteria; the ship’s authorities have money on their minds at all times; disposable crew members are picked off in small increments; heck, there are even things that pop out of stomachs and girls in tiny, objectifying briefs. The technology allows the film to look fresh and updated but the familiarity left me wondering if I was watching a remake and also why no one told me ahead of time. So, once you realize PROMETHEUS is an ALIEN movie, the question becomes is it actually a good ALIEN movie? It is, to some extent, if you consider the word “alien” to mean beings from outer space and not the specific ones from the original film. Go in expecting them and you will be disappointed. That said, I can’t guarantee you won’t be disappointed if you go in not expecting them either. We wait to see what all the fuss is about for a good hour, and marvel at its beauty, because PROMETHEUS is nothing if not beautiful, but by the time the action comes, we have been waiting for it for so long that it almost feels forced. And I know that genre pics like this warrant all secrecy but the fact is that the spoiler moments in this film almost spoiled it completely for me. There are moments that are just too hard to believe or too sadistic to be taken seriously. Some of these moments are too hard to truly recover from even. Scott may know aliens but he doesn’t seem to know much about creating credible human beings here. 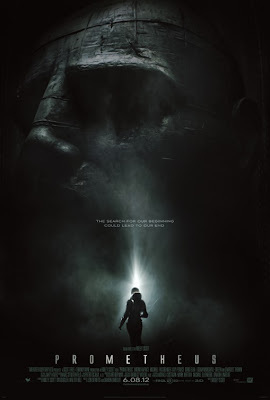 PROMETHEUS is co-written by LOST alumni, Damon Lindelof (along with relative newcomer Jon Spaihts). Like in the popular television series, Lindelof again attempts to tackle ideas about where we came from and where we’re going. And once again, he provides vague musings about our nature that truly only beg more questions. Hence the reason any characters left at the end of the film are only left with one question on their minds; why is this happening? Naturally, they must find out and so PROMETHEUS seems destined to continue its quest, which, while noble in intention, is really nothing more than a setup for a sequel. With that, PROMETHEUS the film reveals its true mission is not so dissimilar to that of the ship. Profit at any expense is always more important than understanding humanity. i actually loved the script and plot here. i didnt’ find any holes with it, though i do wanna see it again. i love that it asks questions, and doesn’t give you all the answers. this makes you feel like you’re exploring on the ship with them. i loved that about it. also, agree with the objectifying of the women (byut we were expecting that, right?). also, i think this is a really great addition to the alien franchise. lastly, i think the plot here is as important as the action so i am glad it’s not all action but much plot. i was intrigued the whole way through. I don’t ordinarily disagree with you and I don’t entirely here either. I too felt like we were exploring with the crew but this is the same tone stricken in the first two Alien movies so it didn’t feel new to me. Plus, we know what we’re waiting to see too. Not that there weren’t scary moments. I too consider it a good franchise addition but I felt like what ultimately happens to Rapace is unbelievable and what happens to Theron is unnecessary and punishing. I don’t like when filmmakers spell out the answers to us. I like questions but I also like feeling like the person asking the questions knows the answers. I didn’t find that Lindelof’s demonstrated and true depth, just the illusion of depth made possible by false intrigue. It’s a strong film but ultimately for me, somewhat hollow as well. Mr Scott, as a younger man, would have been much more critical of the script I feel. 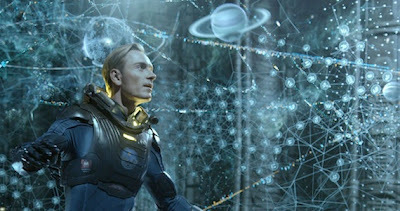 With two bonafide classic sci-fi films already on his cv, Prometheus should have been his crowning glory in that genre. Clearly far too much time was spent on production design, art direction, photography and sfx and not enough time spent curtailing the metronomic sterility of the script.